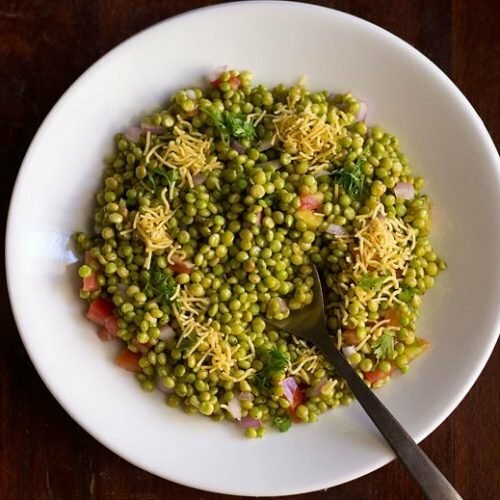 ponk chaat recipe - a savory mixture made with tender jowar or sorghum also known as hurda in marathi language. nutritious, vegan and gluten free snack. rinse the hurda in water for a couple of times. use a fine strainer to rinse these tender jowar. heat a pan. add the tender jowar and roast for 3-4 minutes on a low flame stirring often. you can also sprinkle some water and roast the jowar. they have a nice aroma. in a mixing bowl, add the chopped onion, tomatoes, green chili, the chutneys, salt, roasted cumin powder and chaat masala. add the roasted jowar. mix well. taste and add more salt, chaat masala or chutneys if required. serve hurda bhel in individual bowls or plates. sprinkle few drops of lemon juice on each serving topped with chopped coriander leaves and sev. serve the hurda bhel immediately.